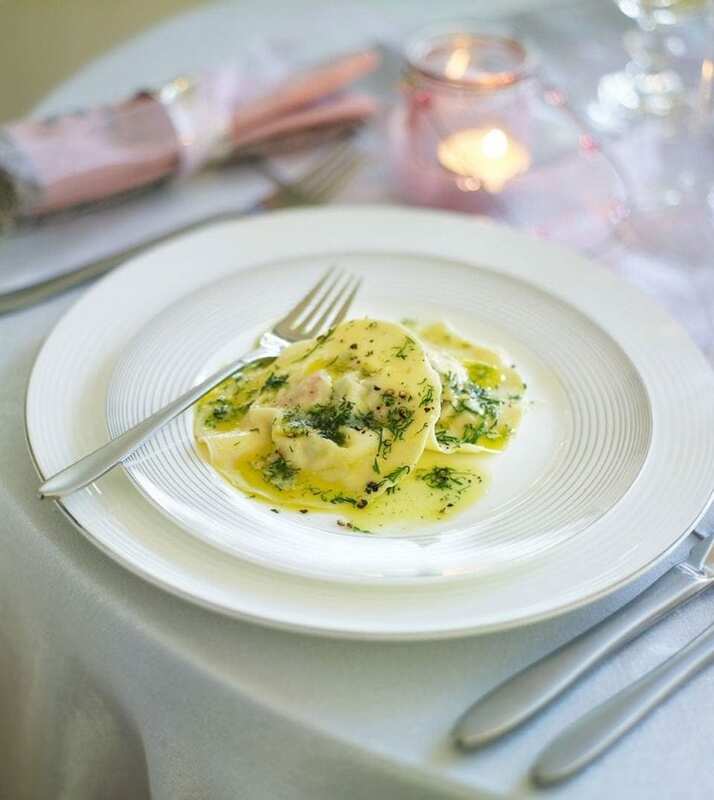 Pair homemade ravioli with indulgent fillings such as this pleasing hot-smoked salmon and ricotta concoction, and then ladle herby melted butter on top. Place the salmon fillets in a food processor and whizz with the ricotta until combined. Transfer to a bowl and stir in all the chives, half the dill and half the lemon juice. Season to taste with salt and black pepper. To make the dough, sift the flour and salt on a large, clean work surface. Make a well in the centre. Beat together the egg, egg yolk and oil and pour into the well. Using the fingertips of 1 hand, gradually draw the flour into the egg mixture in a circular motion to start creating a dough. Add a dash of water if it’s a little dry. Form into a firm ball and knead for 5 minutes, until smooth. Wrap in cling film and chill for 30 minutes. Quarter the pasta dough, take 1 piece and set the rest aside, covering with a tea towel to prevent it from drying out. On a lightly floured surface, roll out the dough quarter until you have a very thin, long pasta sheet, about 45cm long and 12cm wide. Set aside, dusted with flour, while you roll out the remaining pasta to the same size. Depending on how hungry you are, you can either serve 2 or 4 ravioli each. If you’re only eating 2 ravioli each, freeze the rest for another day (see tip). To serve, bring a pan of water to a rapid boil. Drop the ravioli into the water and, when they rise to the surface, (after just 30 seconds) cook for 2 minutes until tender but still al dente. Drain well. Melt the butter in a small frying pan, squeeze in the remaining lemon juice and remaining dill and whisk together well. Arrange the ravioli on serving plates and spoon over the buttery sauce and serve. If you don’t have time to make your own ravioli, you can always cheat by buying ravioli from good Italian delis or order online. FREEZE: Open-freeze the uncooked ravioli at the end of step 4 until solid, then transfer to a container or freezer bag and freeze for up to 3 months. Cook in a pan of boiling water from frozen until piping hot and tender. I love this recipe because it’s fresh, simple and really delicious. It helps make homemade pasta even more rewarding because the end result is so good!